document retrievers is at your fingertips! Who would you call to pull criminal records in Cornersburg, Ohio? Once you found someone how could you determine if they were competent? The 2004 Sourcebook to Local Court and County Record Retrievers provides the answers to these questions and many more. Considered the “Who’s Who” of the document retrieval industry, the Retriever’s Book enables you to find the retriever you need quickly and easily. The book is conveniently divided into two sections. The first allows you to search for a retriever by state and county. It further details which type of courts and records the company specializes in for each particular county. There are over 14,000 company listings indexed by county. The second section provides alphabetically arranged profiles on more than 2,600 companies. The profiles detail contact information, local retrieval areas, types of records retrieved, billing terms, turnaround times and additional information. Included in the list of 2,600 companies are over 700 members of the Public Record Retriever Network (PRRN). This organization has set industry standards for the retrieval of public record documents and operates under a Code of Professional Conduct. Each member is identified by an icon of the PRRN logo next to their company name. Now, establishing a nationwide correspondence network is easy. 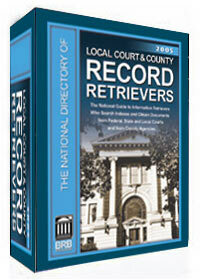 With The Local Court and County Record Retrievers Book you literally have one at your fingertips.